Watching TV shows or movies can sometimes be hard for non-native English speakers. Unless the video has subtitles, it's easy to miss certain words and expressions. With Aegisub you can create your own subtitle files or edit those you find on the web in order to adapt them to the video you want to watch and make sure you don't miss a single word. 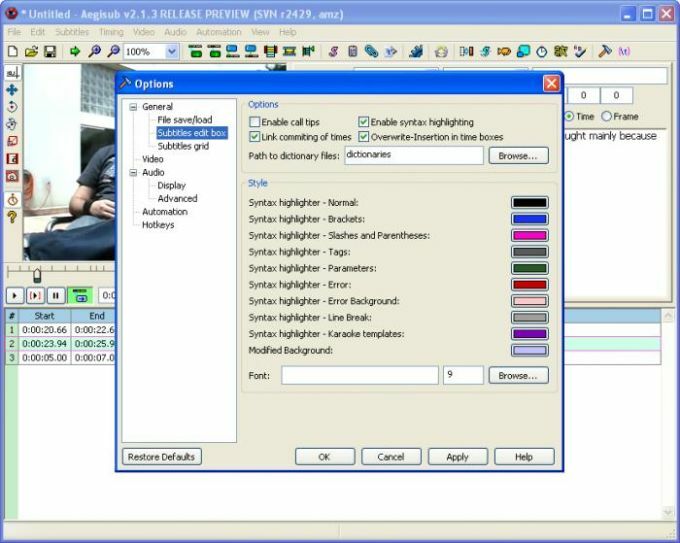 Aegisub includes all the tools you need to create a complete subtitles file in any of the most popular subtitles formats. The program's interface features a built-in player with which you can have the video always at sight and therefore work on subtitles more comfortably. Subtitles can be inserted according to time or frame number, have rich-format elements and also show special effects – such as animated colors, perfect for karaoke. Aegisub will probably please all subtitle specialists, but may be a bit confusing for newcomers. Luckily, it includes an extensive documentation that explains all program's functions in detail and even includes some tutorials. 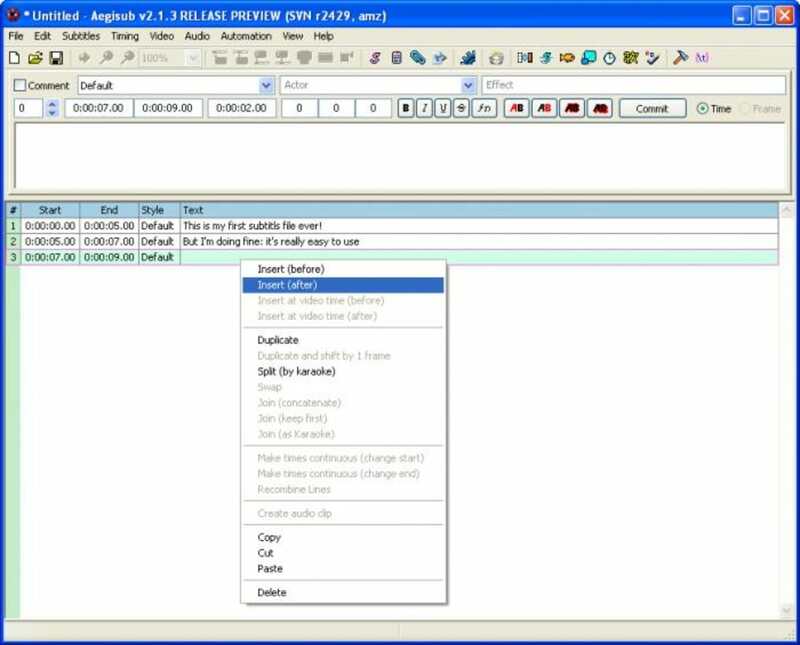 With Aegisub you can easily create and edit subtitle files for movies and karaoke videos. The program supports all popular subtitle formats and is thoroughly documented. What is it? It's the AUDIO GRAPH. It tells you exactly WHEN (subtitles is about timing, right?) the actor or singer speak or sing by drawing a very interesting go-up, go-down, curved-like graph that you could image as if when you speak with tone, with pause, with power, you name it. So, follow this simple steps (remember the AUDIO GRAPH!) to get used to this program. After having Aeigsub launched, click &quot;Video&quot; in the menu bar, click &quot;Open Video...&quot;, and pick out your video file (as far as I'm concerned, Aeigsub can open any video files, but just in case it cannot, just use another free advanced media converter &quot;Format Factory&quot; for converting to Aeigsub recommended formats, e.g '.mp4'). Next, in the menu bar click &quot;Audio&quot;, then click &quot;Open Audio from Video&quot;, n wait a sec and the graph will show up. Now everything is almost done. Oops I recommend to play around with the buttons that look familiar to you, like play, pause buttons, etc. In fact, just like another program, if you hover the button for a sec, the info about the button will tell you enough info of what it's to do for you. Just try them out first, and I believe you can get used to it ASAP, and of course you can make or perhaps modify subtitles even only with the familiar buttons. OK, JSUK, I even don't use the other buttons because simply idk them (yet). lol. But at least I can feel the easiness when making and editing subtitles with Aeigsub. Again, remember the very useful AUDIO GRAPH! It's an advanced subtitler! It's so intuitive that makes the process of subtitling easy and as fast and accurate as the user wants. What do you think about Aegisub? Do you recommend it? Why?